So awesome comics dude, Matt Reidsma approached Maris, Liz and myself a little while ago, asking if we would be interested in participating in a comic anthology he was headlining. We were - and it just so happened that the comics anthology he was talking about is all about Marshmallow Fluff. Apparently the stuff was founded in Union Square of Somerville (where we all live), and each year there's a 'Fluff Festival' there where fluff art is sold, music is performed, and a general good time had by all. This is, I think, the first year they're releasing a comic along with the festivities, so it should be fun. Above is the promo image I did for the comic/event. 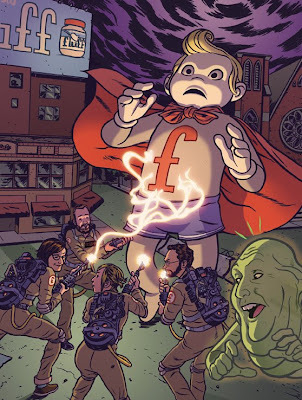 It depicts the four of us, plus the cover artist George Pfromm III as Slimer versus Fluffboy himself. Anyway, read up on more details on the event here.